Ted Cruz won a big victory in Texas. There are several meanings to this victory, the first being that the Tea Party still matters. David Dewhurst was the establishment favorite and as Lt. Governor, he had the perch to easily win the race including name recognition and access to money. Dewhurst had the money, including his own wealth, but what he lacked was the grassroots' support, which became obvious this past Tuesday. Even his other leading opponents from the original primary endorsed Dewhurst for the run off. One would have assumed that Tom Leppert's and Craig James' voters would have either stayed home or given the majority of their votes to Dewhurst. Dewhurst was close to the magical 50% after the original primary, so he had very little to add for victory. Two things hurt Dewhurst, who actually lost votes from the primary to the runoff. While Dewhurst received the support of much of the Republican establishment, his support was always mile wide but an inch thick. If a politician is putting pressure on business leaders not to endorse his opponent as was reported, maybe there is a problem with the candidacy. The second problem was Dewhurst's own campaign, which was one negative ad after another. As one reporter noted, this only succeeded in raising the name ID of Cruz. In the original primary, both men received nearly equal percentage of Tea Party members, but this changed in the runoff as Cruz captured three quarters of Tea Party voters. 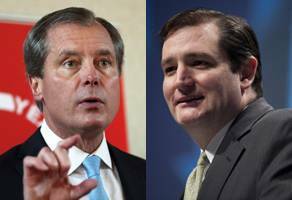 Dewhurst's negative ads not only backfired and gave Cruz a lifeline, it also showed that Dewhurst had little to offer the voters. You would have figured that the Lt. Governor of a job-creating state would be able to give the voters positive reasons to vote for him. He didn’t. Cruz came in the race with no money and no real candidate ID, but he managed to build up grassroots support one vote at a time; and more importantly, he gave the grassroots reasons to vote for him. He was taking their message and ideas to Washington, and in a state where favoring smaller government is a plus, he showed to be fully capable in explaining free market ideas. The lessons here are the following. Ideas can triumph establishment, support, and money. This lesson is important for Romney's campaign in that he may be outraising Obama in fundraising, but it is the message that will defeat Obama. Dewhurst's scorched earth and negative campaigning fail to move the electorate since it was not accomplished by what Dewhurst would do to keep the Texas economy going. For Team Romney, it is not enough to say what you don’t like about Obama’s policy but what you will do differently and explain why what you will do is better for America! Obama's own campaign resembled Dewhurst for its negative tone, and when you add that unlike Texas, Obamanomics has been a complete failure, ideas will triumph. The second idea is that the Tea Party is evolving and becoming politically astute. They showed that they would have been willing to give Dewhurst their support, but he never gave them a reason. Cruz did and that is why he won. The Tea Party is a force to be reckoned with. This brings me to the final point. Cruz can make the case and demonstrate that free market and conservative ideals can lead to economic revival among Hispanic communities. Cruz, like Rubio, Governor Susan Martinez and Brian Sandoval, are part of a new generation of conservative leaders who are ready to take up the mantle of free market ideas; and yes, they are also part of the fastest demographics, Hispanics!